Bonn, 9 May 2018 - “Unifying our Voices for Bird Conservation” is the theme of World Migratory Bird Day 2018. Among the significant, but often underestimated threats to migratory birds across the African-Eurasian Flyways - the major bird migration corridors which links Europe, Africa and Western Asia - is lead poisoning. The UN Convention on Migratory Species (CMS) and the Agreement on the Conservation of African-Eurasian Migratory Waterbirds (AEWA), two international environment treaties behind World Migratory Bird Day are also driving international efforts to tackle this global threat. Lead poisoning is caused when lead is released into the environment. Lead is a highly toxic heavy metal that is used for both fishing weights and hunting. When fired from a shot gun, hundreds of lead pellets fall into the wider environment putting wildlife at risk. Between 400,000 and 1.5 million waterbirds alone die in Europe annually from ingesting this lead. The number of additional birds suffering health problems because of poisoning by lead ammunition is at least as large as the number killed by lead shot every year. Waterbirds and other birds see lead shot or lost fishing weights and pick them up either as food or mistaking them for grit. They die directly from poisoning or the ingested lead affects their immunity, behaviour and reproductive capacity. Raptors and scavengers pick up the lead shot or fragments of bullets in the prey or carrion they eat. Lead left in the environment contaminates soils, and people are exposed when they consume lead-shot game. While habitat loss, pollution, unsustainable harvest and agricultural practices, illegal killing and trapping as well as collision and electrocution by power lines are among the greatest dangers to migratory birds, lead poisoning is one of the threats, for which there is a practical solution. Lead-free ammunition is now available and has been demonstrated by research and in practice to be effective. Many hunters already use non-toxic ammunition. Some countries such as Denmark and the Netherlands have completely phased out all lead shot more than 20 years ago. Changing to non-toxic alternatives could benefit nature conservation and human health. A ban on lead ammunition resulting in reduced lead emissions, secondary poisoning of vultures and other raptors and risks to human health, would bring substantive economic benefits to society in terms of healthy people and a healthy environment. AEWA was the first international treaty to focus on addressing the problem of lead ammunition. 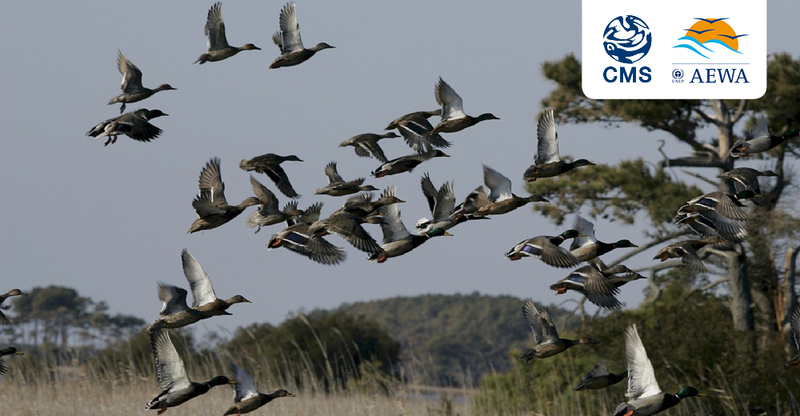 CMS addressed lead poisoning to prevent the risks to migratory birds and called for lead ammunition to be phased out across all habitats. While many countries in North America and Europe have made progress to ban lead in wetlands, CMS wants to take the issue to a global level and extend it to all habitats. To support this effort, CMS has formally established the Lead Task Group, a multi-stakeholder expert group bringing together the industry, the hunters and conservationists to help Member States facilitate concerted efforts to minimize poisoning of migratory birds from lead ammunition and fishing weights. World Migratory Bird Day is celebrated each year to highlight the need for the conservation of migratory birds and their habitats. More than 300 events in more than 60 countries to mark World Migratory Bird Day 2018 (registered on the website) will include bird festivals, education programmes, media events, bird watching trips, presentations, film screenings and a benefit concert to raise funds for international nature conservation. EFTA works with diverse partners to provide English and Spanish educational materials and information about birds and bird conservation throughout the Americas. Their programmes inspire children and adults to go outdoors, learn about birds, and participate in their conservation. www.worldmigratorybirdday.org/partners. The Convention on the Conservation of Migratory Species of Wild Animals (also known as CMS or Bonn Convention after the city in which it was signed) aims to conserve terrestrial, aquatic and avian migratory species throughout their range. It is an intergovernmental treaty, concluded under the aegis of the United Nations Environment Programme, concerned with the conservation of wildlife and habitats on a global scale. Since the Convention's entry into force in 1979, its membership has grown steadily to include 126 Parties from Africa, Central and South America, Asia, Europe and Oceania. CMS and its related Agreements on migratory birds bring together governments and other stakeholders to coordinate and further develop conservation policies, to ensure that all flyways in the world benefit from coordination mechanisms that promote cooperation at ground level among the countries involved. A special instrument for birds of prey (Raptors MOU) to addresses threats to these species.